We are going to do a Christmas Tree themed party in my 1st grader's class this year! The kids will have just eaten lunch, so we're only doing a couple of goodies for food. I'm thinking some cupcakes that look like Christmas tree ornaments and these cute cookies from Real Simple with snack mix and drink boxes. 1. 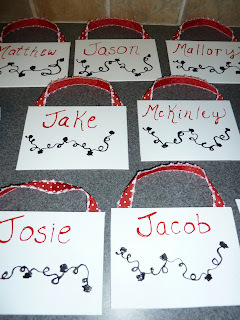 Christmas Light Thumbprint Craft - for this craft, I took 5x7 flat canvases, added ribbon to the back, added the kids' names in red puff paint, and added the light string in black puff paint. The kids will add their thumbprints as the lights with colorful acrylic paints! 3. 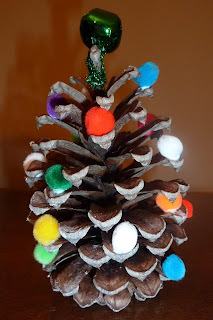 Pinecone Christmas trees (adapted from giverslog.com) - for this craft, I got pinecones, pom-poms, jingle bells, and pipe cleaners. I cut the pipe cleaners into thirds and threaded through the jingle bells. The kids will glue on the pom-poms like ornaments and wrap the pipe cleaner jingle bell around the top. 4. Ornament picture frames - this is just a foam kit where the kids decorate the ornament with their picture in it. I took their pictures and cut them into 2 inch circles beforehand, & the kids will do the rest! 5. 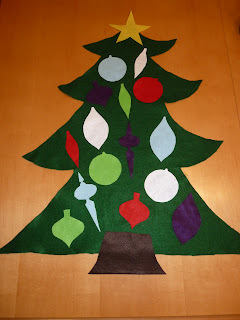 Large felt Christmas tree to decorate (adapted from emptybobbinsewing.com) - I got 1/2 yard green felt and small sheets of yellow, brown, purple, red, white, light blue, and lime green felt. 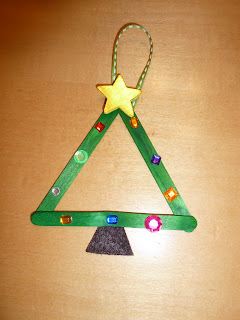 I cut the large green felt into a Christmas tree shape. I cut the yellow felt into a star, the brown felt into a stump, & the remaining felt into ornament shapes. For the star and ornaments, I printed out the shape or clip art on card stock to use as my cutting guide. The kids will be able to decorate the tree like they want by moving all the shapes around! 6. Decorate each other like a Christmas tree - for this game, I got 6 feet of green garland, plastic colorful ornaments (non-breakable! ), ornament hooks, a small star tree topper, and gold pipe cleaners. I put the ornament hooks on the ornaments. I used the gold pipe cleaners to loop around the star tree topper and to form a circle to fit their heads. They will take turns wrapping each other in green garland, adding ornaments, and putting the star on top! At the end, we will come back together as a group and do Christmas light limbo, read some books, and eat some goodies! For Christmas light limbo, I took a flag pole (that sometimes goes on our house) and wrapped it repeatedly with multi-colored Christmas lights. To play, simply plug it in, play some Christmas music, and let the kids limbo under it! In keeping with the Christmas tree theme (of course! 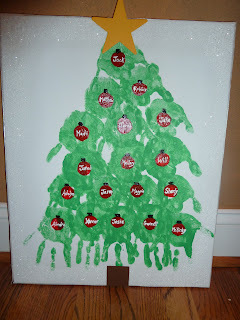 ), part of our teacher's Christmas gift will be a hand print Christmas tree. I got a 16x20 canvas, spray adhesive, white snowy glitter, ribbon, green acrylic paint, brown acrylic paint, square chipboard, a wooden yellow star, red acrylic paint, and black and white puff paint. I put spray adhesive an inch or so around the border of the canvas and sprinkled glitter on. Then, I also applied ribbon to the edges using spray adhesive. 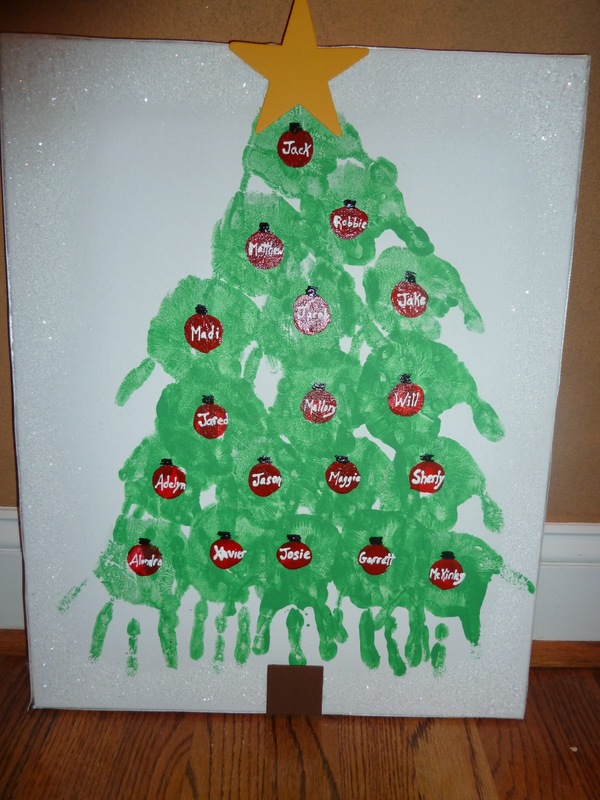 Next, I had the kids put their hand prints on the canvas in a Christmas tree shape using the green acrylic paint. I added the wooden star and a stump by painting a square piece of chipboard brown. 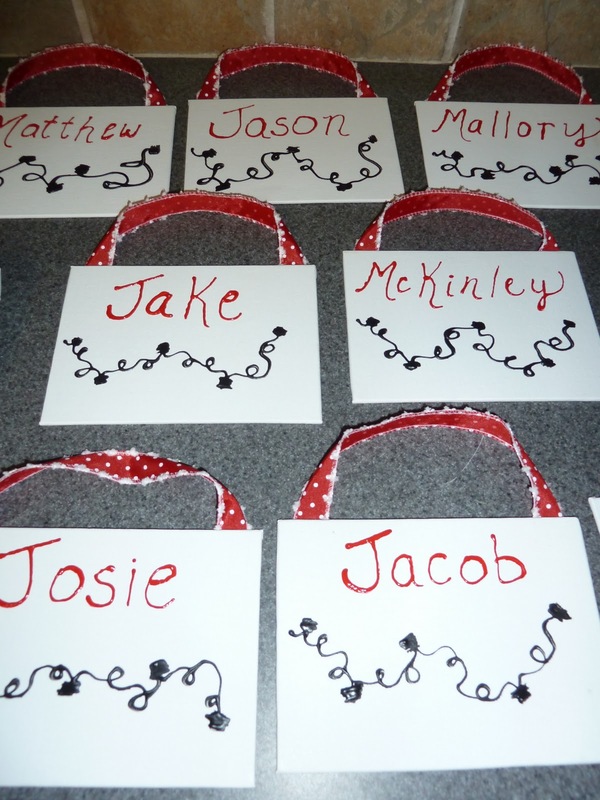 I used a round brush to make red polka dots and then added the kids' names in white puff paint and squiggled an ornament top in black puff paint. It turned out so cute! I think it will be a fabulously fun party!